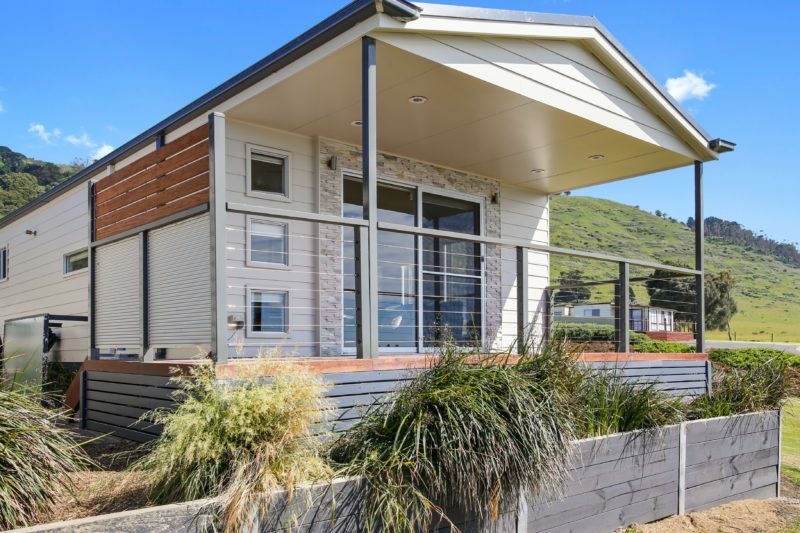 BIG4 Apollo Bay Pisces Holiday Park is located directly opposite Apollo Bay’s main beach. 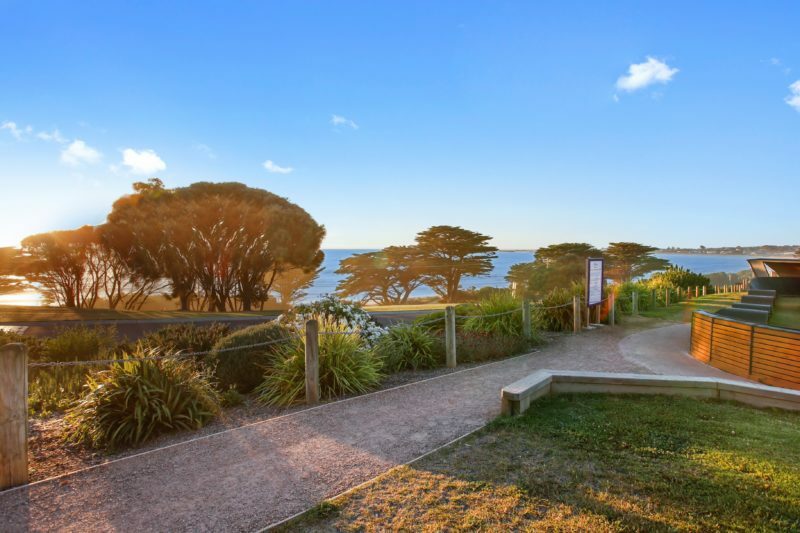 The park features high quality three bedroom villas, ocean spa cabins, ensuite and powered sites and camping sites all with stunning views of the ocean and Apollo Bay harbour area. 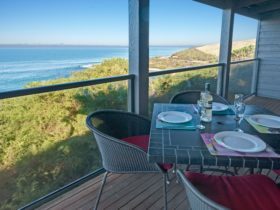 The villas include three separate bedrooms, verandas with full ocean views, gas log fires, air-conditioning, spa, shower, toilet, cable television, DVD player, full kitchen with dishwasher and laundry. 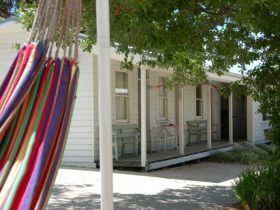 The park also offers accommodation in spa, deluxe and budget cabins. 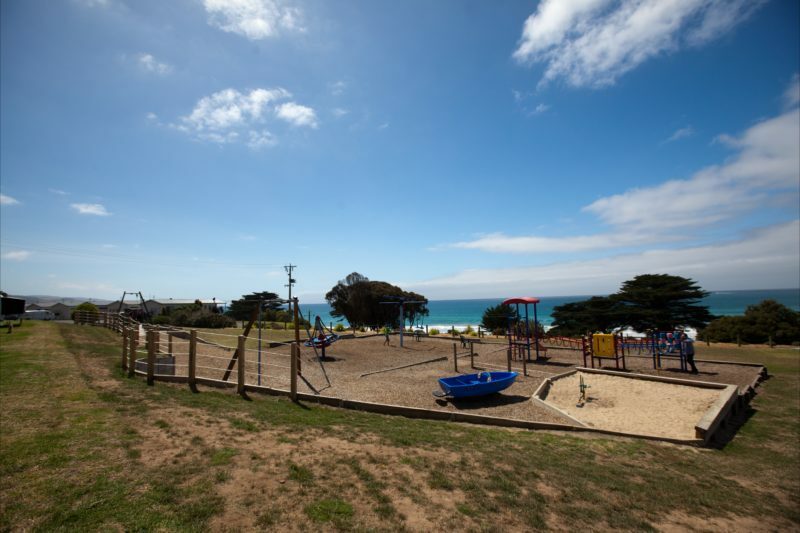 Park facilities include fully heated swimming pool, large amenities with laundry and dedicated disabled and family bathrooms, free barbecue areas, camp kitchen, television room, wireless Internet, adventure playground which includes a flying fox and bike pump track and a games room. The Deluxe Cabins have two separate bedrooms for five or six guests with a queen bed in the main bedroom and either a tri-bunk (single bunk over a double bed) or two sets of bunks in the second bedroom with all linen provided. The cabins feature a full kitchen with a large fridge and freezer, bathroom with a shower and separate toilet, lounge area with a television, DVD player and split system heating and cooling. There is also a balcony with outdoor setting. These Ensuite Cabins have two separate bedrooms and sleep five or six guests. The main bedroom has a double bed and the second bedroom has either a tri-bunk (single bunk overtop a double bed) or two sets of bunks with all linen provided. The Ensuite Cabins feature a small fridge, microwave, four burner stove with oven, bathroom with a shower and toilet, lounge area with television and split system heating and cooling. 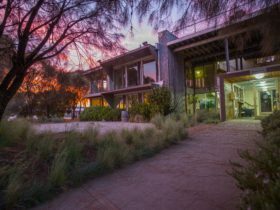 These beautifully appointed four star villas offer panoramic ocean views with three bedrooms and are fully self-contained. The main bedroom has a queen bed with a tri bunk (single bunk over a double bed) in the second and another bunk bed in the third bedroom, all linen provided. There is a full kitchen that includes an in-wall oven, dishwasher, large fridge and freezer, gas cook top and microwave. 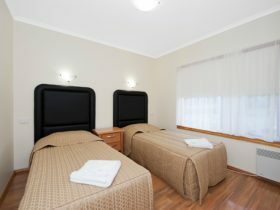 The bathroom has a spa and separate shower, laundry with washing machine and dryer and the lounge features a flat screen television, DVD player, X-Box and Foxtel. There is also a gas log fire and air conditioning and a large balcony with outdoor setting. 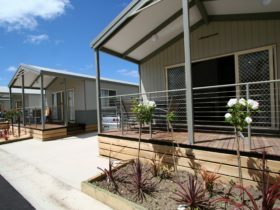 Ensuite powered caravan sites with concrete slabs, not suitable for camping. These beautiful self contained four star villas offer uninterrupted ocean views with two separate bedrooms for up to five or six guests. There is a queen size bed in the master bedroom with a tri bunk or two bunk beds in the second bedroom, all linen provided. 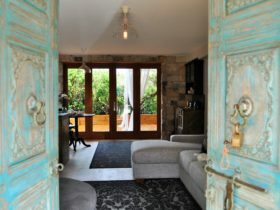 They feature a full kitchen with a large fridge and freezer and a microwave, bathroom with a shower and separate spa bath and in the lounge area there is a gas log fire, a television, DVD player and air conditioning. The front balcony area has an outdoor setting overlooking the ocean. These spacious well grassed sites offer a choice of slab or grass with water, sullage and power, close to amenities. These two bedroom fully self contained Spa Cabins offer a queen size bed in the master bedroom with a tri bunk or two sets of bunk beds in the second bedroom for five or six guests (all linen provided). They have a full kitchen, bathroom with a shower over spa bath, and in the lounge area there is a gas log fire, a television, DVD player and air conditioning within the cabin. There is also a balcony area with outdoor setting overlooking the ocean. 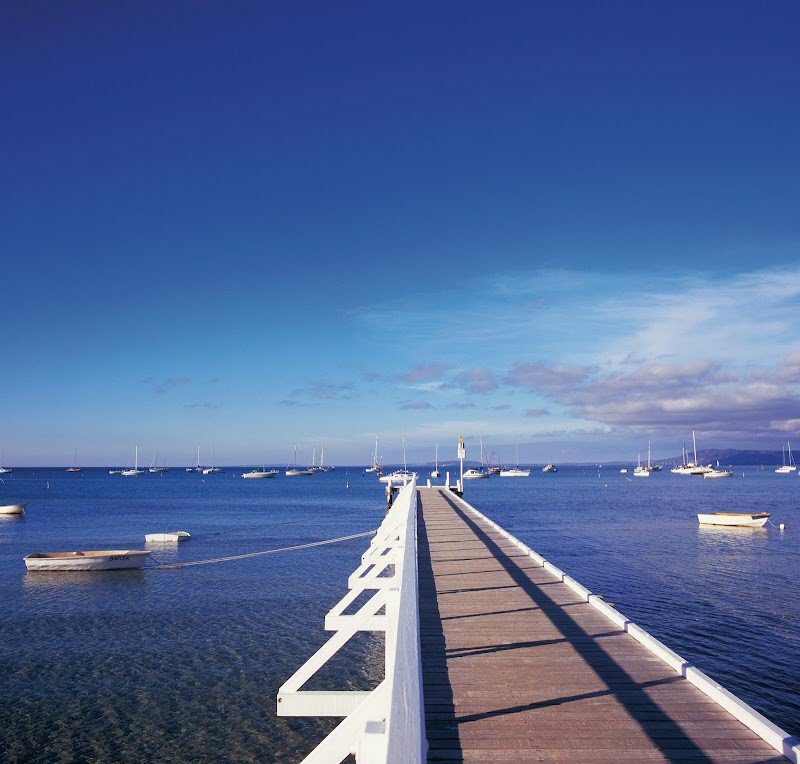 These spacious well grassed sites are perfect for camping with full access to all park facilities. Please visit our website where you can access up to date information on pricing and availability, or make contact directly for further information.